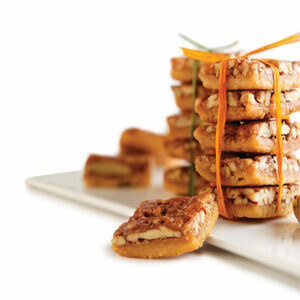 Send that special someone some scrumptious Georgia Pecan Bites. These authentic southern treats are handmade with local Georgia pecans. They are baked fresh from scratch by Shamsi Bakery. Each order comes with 15 delectable pieces. Each pecan bite has loads of tender pecans, a crispy crust, and a chewy yummy caramel filling. Not too sweet, but definitely indulgent!